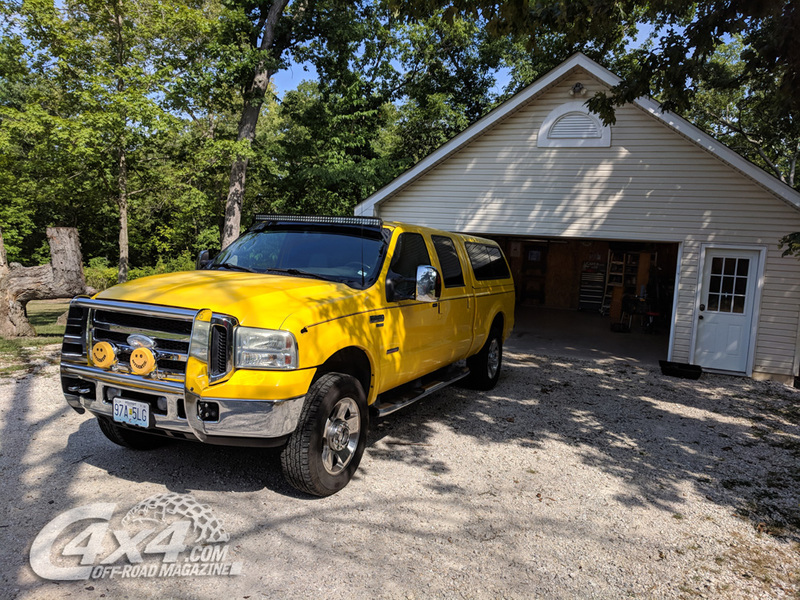 It was about 98 degrees out, about 108 on the pavement, and I was on the way back from a nearby Wally-World buying some wash supplies for my 2006 Ford F250, 'Bumble Bee'. On the on-ramp, the F250 lurched and bogged down slightly, but after a moment, came back to life and accelerated onto the highway for my short, 3-mile trip back to work. I was on my lunch break and I was just running an errand. Less than 1/2 mile from my exit, my F250 chugged a couple times then abruptly died. I put the transmission into neutral and hit the 4-way flashers and let it roll down the shoulder as far as the inertia would take me. When it stopped, I put the transmission into park, and restarted the truck. It came back to life, so I put it in gear and continued my cautious roll toward my exit. After about another 100-yards, it died again. This time, I was only able to gain a small distance before I came to a complete stop. Put the truck in park and tried restarting again; nothing. The Bumble Bee would not start. After my mind raced through the worst; high pressure oil pump, injectors, etc, I had to call my work, since I was on lunch, and a tow truck. While I waited, I tried to troubleshoot the issue with the guy I consider my 6.0 genius and the best mechanic I have ever used. We determined I needed more info before the problem could be surmised. The tow truck operator arrived and the fee just to hook the truck and get me to my work, 2.7-miles away, was a cool $86.00. It's no wonder I didn't have him drop me off then take the truck home; a 40-mile bill would have made me cry. I decided instead to call on the good friends I had made in the Christian Off-Road Association, Saint Louis chapter. Over my many years of rock crawling and being among the founders of United Christian Off-Road Alliance, I have never taken for granted the value in good friends, and even more the value in good friends with big trailers! A huge shout out to John, the President of CORA-STL as he came to my work after we both were off and loaded my truck onto his trailer using a high-lift jack and some pure ingenuity. John towed me home and we pushed the truck into the shop. Over the course of the day, my best guess for what to look at first was the Ford frame mounted fuel pump. After some headache getting a new pump from the parts store, my repair was then delayed a couple days until finally, Saturday morning, I was able to get under the truck and get the frame-mounted pump replaced. I opted to replace the entire HFCM (Horizontal Fuel Control Module) since mine had never been touched and the replacement would be much easier than breaking it open and replacing just the pump. The first step was to unplug the 2 wiring harnesses going into the Fuel pump. **Writers note: ALWAYS remove BOTH negative battery cables when working around the electrical and fuel in your truck. 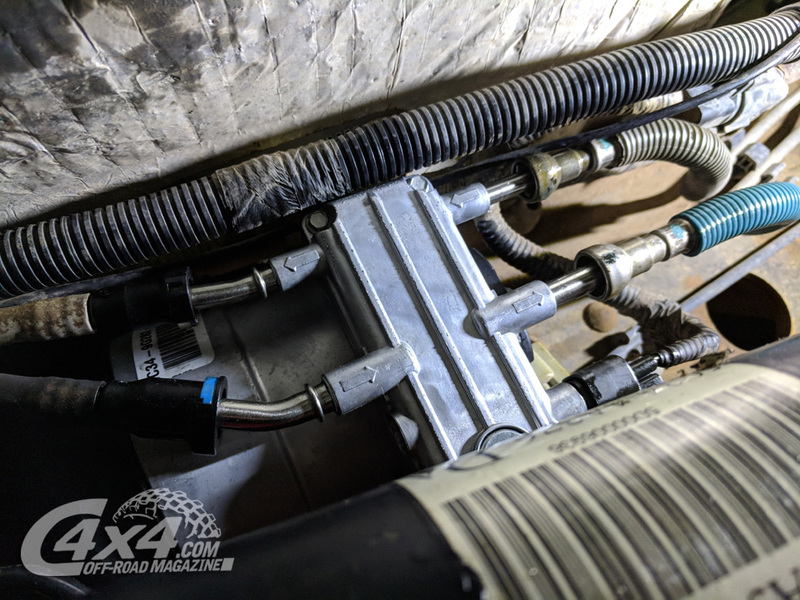 ** After the wiring was removed, I worked on removing the 4 quick connect fuel lines from the housing. 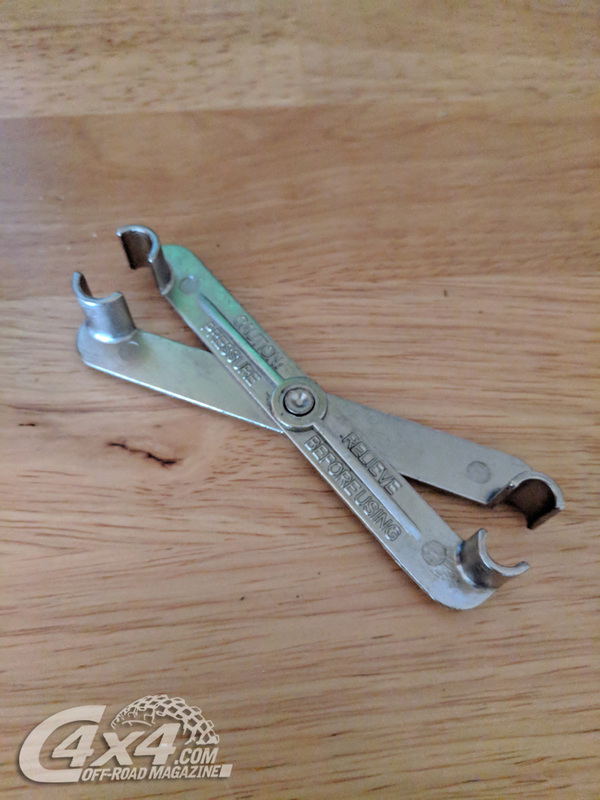 I had read online that there is a simple tool, which cost about $8.00, that would make the job much easier, so I decided to buy one. This simple fuel line removal tool did its job very well. 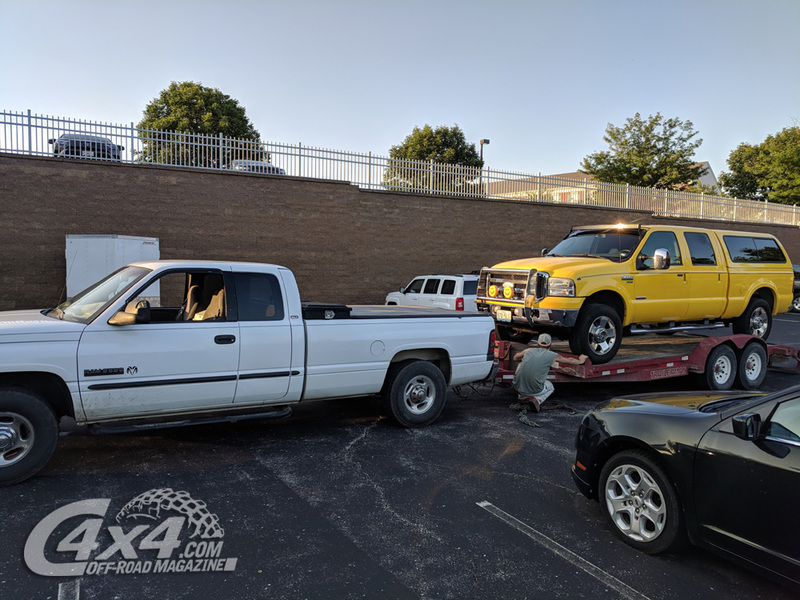 After a slight learning curve, all 4 fuel lines came off very easily, even after 110,000 miles of road grime and JB-Crud was under the truck. 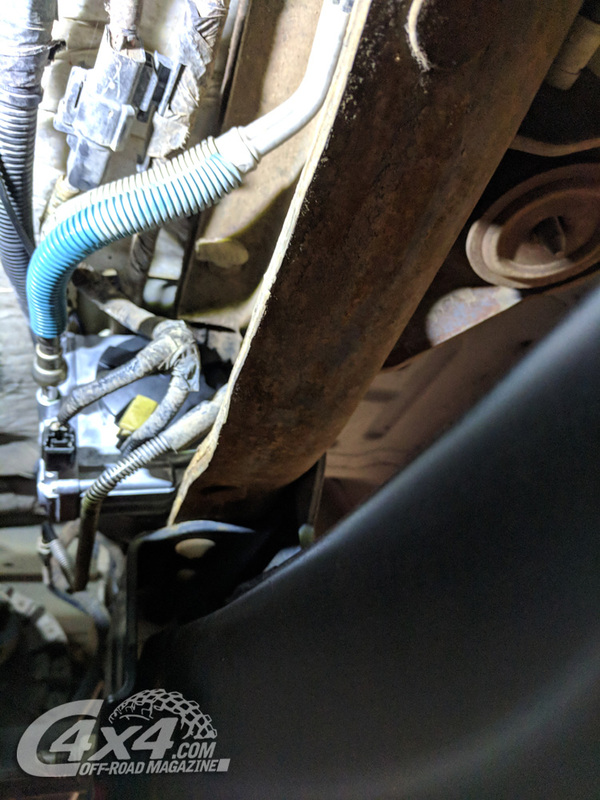 After the fuel lines were removed and residual fuel was draining, all that was left were 3 nuts on the backside of the frame holding the unit in place. My pneumatic ratchet made quick removal of the nuts and I removed the housing by lifting in and then back slightly to clear the other lines and cables on that area of the frame. 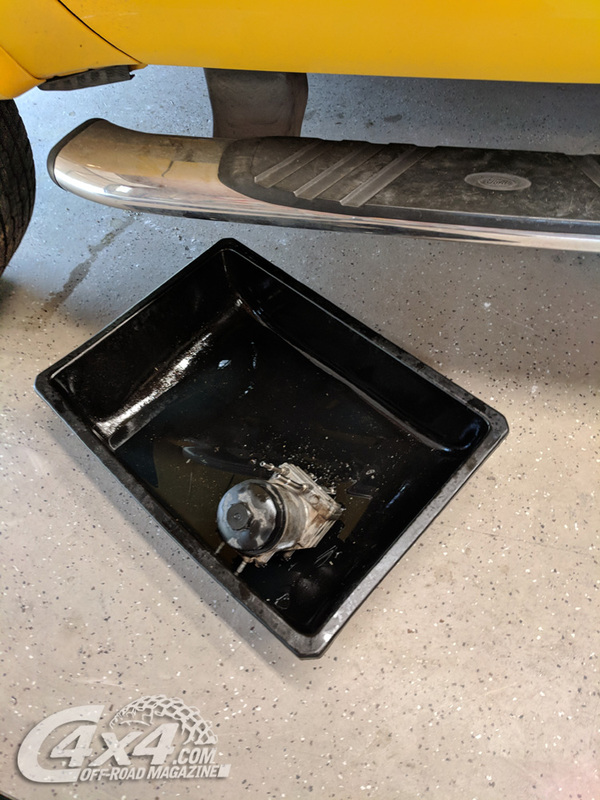 In about an hour and a half, I had the old fuel pump completely removed from the truck and the residual diesel fuel drained into my catch pan. I then simply reversed the process to install the new HFCM. I placed the unit into the frame rail and mounted the 3 nuts on the backside. The fuel lines slid right back on with a quick *click* and they were locked in place. Finally, I plugged in the two sets of wires and it was done! The reinstall took me about an hour total and that included some touch up of some rusty frame spots with a quick shot of black spray paint. 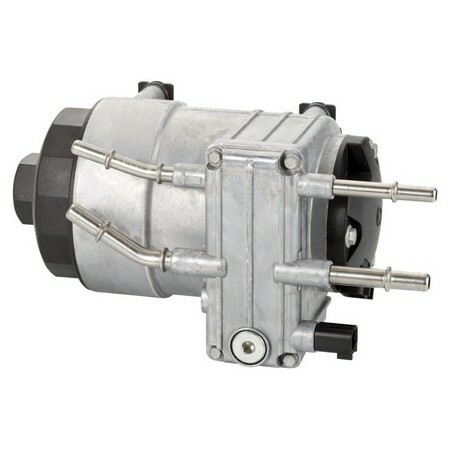 Now, I was really starting to sweat because if this did not fix the truck, I was going to have to dig deeper into my pockets and pay for some help. I rolled the truck out of the shop, said a brief prayer, and turned the key. 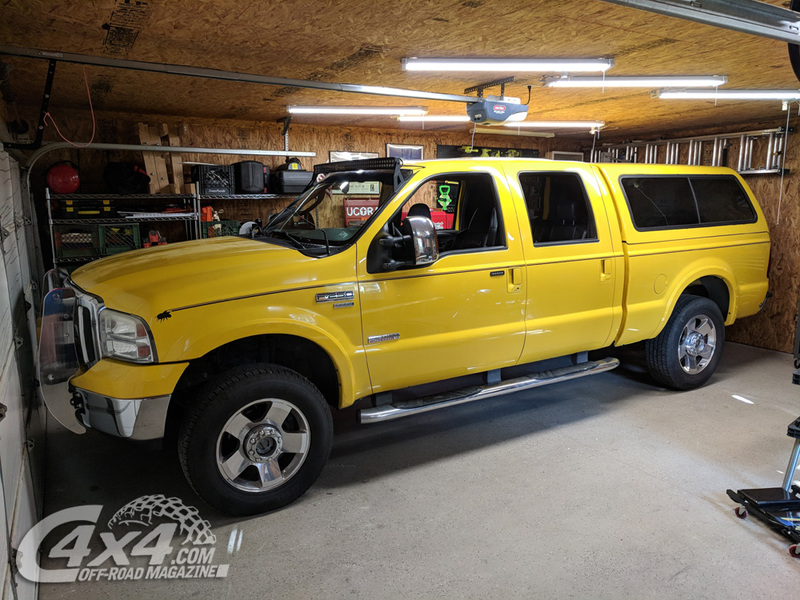 The '06 Ford roared to life and idled great. I let it run for about 10 minutes at idle to make sure any trapped air was bled out of the system. Finally, I took 'Bumble Bee' out for a test drive and the truck performed great! 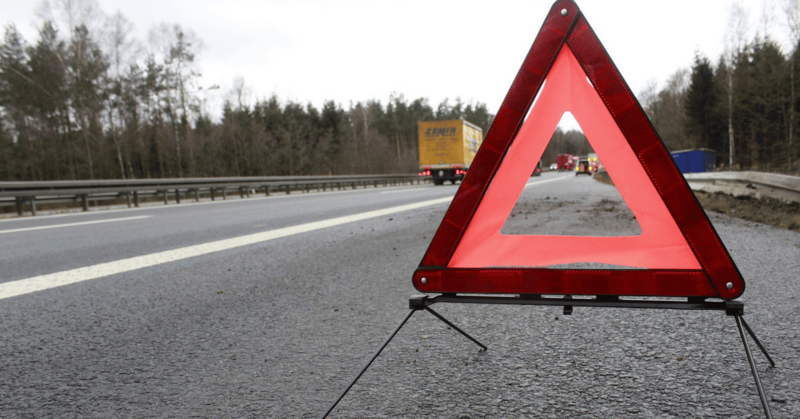 What caused the stranding on the highway? The final break in the chain was a fuel pump, but what about contributing factors? Admittedly, I have never replaced the fuel filters on the truck, so I will take the blame on this one. So I did it! The new shop on my property had been broken in with its first job. I, being the accessory installing and electrical enjoying guy who has little to no mechanical knowledge, was able to complete the repair. Had it not started, what would I have done? I have no idea. When it comes to the heart of vehicles, I am a lot less confident than I seem. I am always willing to try, but usually not on my own. I am just glad that adventure will wait for another day. God bless and I can't wait to see you again when our roads cross.